Simple ribs, fall-off-the-bone, start to finish in 45 minutes! Cut rack into 2-3 bone pieces. 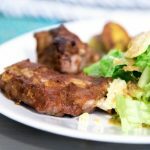 Pile ribs into Instant Pot on top of a trivet or in a basket to keep out of the 1.5 cups water you need for the pressure cooker (add mentioned 1.5 cups to Instant Pot). Set to 30 minutes High Manual/Pressure Cooker function and seal with lid. When done, release the pressure (quick release), use tongs to ribs to cookie sheet, and preheat oven to high heat (~450 F). Alternatively, you can do this final step on the BBQ. Brush on BBQ sauce and then broil until sauce is caramelized – but not burned! Keep an eye on it, you don’t want to screw it all up when you’re so close to getting this juicy meat in your mouth! Flip ribs, brush with more sauce, and broil this side as well.